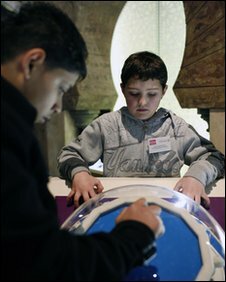 An exhibition that has just opened at the Science Museum is celebrating 1,000 years of science from the Muslim world. A look around the Science Museum exhibition, '1001 Inventions: Discover the Muslim Heritage in Our World'. From about 700 to 1700, many of history's finest scientists and technologists were to be found in the Muslim world. In Christian Europe the light of scientific inquiry had largely been extinguished with the collapse of the Roman empire. But it survived, and indeed blazed brightly, elsewhere. From Moorish Spain across North Africa to Damascus, Baghdad, Persia and all the way to India, scientists in the Muslim world were at the forefront of developments in medicine, astronomy, engineering, hydraulics, mathematics, chemistry, map-making and exploration. A new touring exhibition, hosted by the Science Museum in London, celebrates their achievements. Salim Al-Hassani, a former professor of engineering at Umist (University of Manchester Institute of Science and Technology) is a moving force behind the exhibition, 1001 Inventions. He calls it "edutainment": a series of displays devoted to different aspects of science meant to be both educational and entertaining. "We hope to inspire the younger generation to take up a career in science and technology and to be interested in improving the quality of societies," he says. Visitors to the exhibition will be greeted by a 20 ft high replica of a spectacular clock designed in 1206 by the inventor Al-Jazari. It incorporates elements from many cultures, representing the different cultural and scientific traditions which combined and flowed through the Muslim world. The clock's base is an elephant, representing India; inside the elephant the water-driven works of the clock derive from ancient Greece. A Chinese dragon swings down from the top of the clock to mark the hours. At the top is a phoenix, representing ancient Egypt. 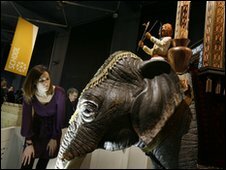 Sitting astride the elephant and inside the framework of the clock are automata, or puppets, wearing Arab turbans. Elsewhere in the exhibition are displays devoted to water power, the spread of education (one of the world's first universities was founded by a Muslim woman, Fatima al-Fihri), Muslim architecture and its influence on the modern world and Muslim explorers and geographers. 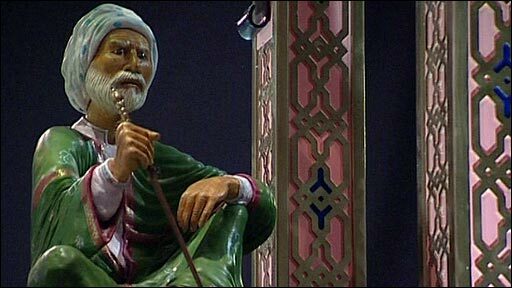 There is a display of 10th Century surgeons' instruments, a lifesize model of a man called Abbas ibn Firnas, allegedly the first person to have flown with wings, and a model of the vast 100 yard-long junk commanded by the Muslim Chinese navigator, Zheng He. Outside the main exhibition is a small display of exhibits drawn from the Science Museum's own collection. They include a 10th Century alembic for distilling liquids, an astrolable for determining geographical position (and the direction of Mecca - important for Muslims uncertain which way to face when praying). Also on display is an algebra textbook published in England in 1702, whose preface traces the development of algebra from its beginnings in India, through Persia, the Arab world and to Europe. Dr Susan Mossman, project director at the museum, says: "There is a whole area of science that is literally just lost in translation. "Arabic and Muslim culture particularly is a little-known story in Britain. This is a real opportunity to show that hidden story." She says the hands-on exhibition suits the museum's style, which she describes as "heavy-duty scholarship produced in a user-friendly way and underpinned by academic research". She adds: "We are opening people's eyes to a new area of knowledge - a cultural richness of science and technology that has perhaps been neglected in this country." There is one big question the exhibition does not address: why, after so many centuries, did the Muslim world's scientific leadership falter? From the 16th Century onwards it was in Europe that modern science developed, and where scientific breakthroughs increasingly occurred. Prof Al-Hassani has his own theory, though there are others. Science flourished in the Muslim world for so long, he believes, because it was seen as expanding knowledge in the interests of society as a whole. But in the later Middle Ages, the Muslim world came under attack from Europeans (in the Crusades) and the Mongols (who sacked Baghdad in 1258) and the Ottoman Turks overran the remnants of the Byzantine empire, setting up a formidably centralised state. The need for defence against external enemies combined with a strong centralised government which put less value on individuals' scientific endeavour resulted in an intellectual climate in which science simply failed to flourish, he says. The free exhibition runs from 21 January to 25 April with a break between 25 February and 12 March.